Saturn’s odd mix of mid-sized satellites are among the strangest in the outer Solar System. With widely varying densities and locations, measuring between 300 to 1,500 kilometers in diameters, these moons have some distinctive characteristics. Some are made up almost completely of ice, and some are rockier and geologically active. Some even show evidence of submoons and rings. 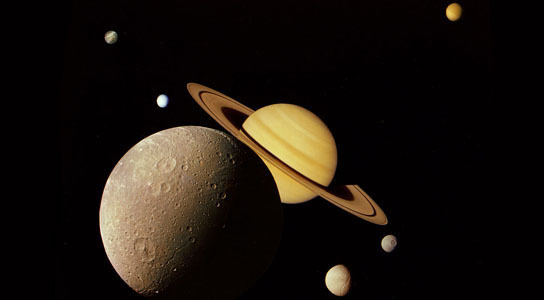 According to a new model proposed by Eric Asphaug, a planetary scientist at the University of California, Santa Cruz, Saturn and its satellites initially resembled the Jovian system, with four larger satellites similar to the Galilean moons. However, Saturn’s moons began to merge, eventually forming Titan. The model was presented at the annual meeting of the American Astronomical Society’s Division for Planetary Sciences in Reno, Nevada. The mid-sized satellites could have been formed from the debris left over by the formation of Titan, with subsequent mergers perhaps explaining Titan’s elongated orbit. The merging could have been triggered by an instability in the Solar System, 3.8 billion years ago. At that time, theorists think that the orbits of Uranus and Neptune were migrating. Since Jupiter’s gravitational grip is more substantial, its moons were relatively impervious to the disturbance. Other astronomers think that the model is too simplistic to work, but the theory is worth exploring further. In this model of how Saturn’s moons formed, two proto-moons merge to produce Titan, and fling away water-rich material that later forms the icy mid-size satellites. Courtesy: E. Asphaug and A. Reufer. Be the first to comment on "Simulation May Explain Saturnian System"